The impact the clutter in our house has on our mental happiness has been evident for some time – pretty much since we moved up to Yorkshire. 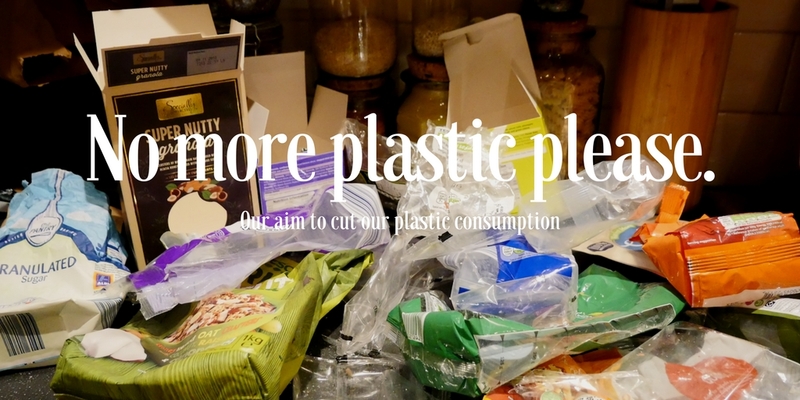 We’ve started doing little bits to start to clear some of our stuff out but the difference it has made to our living space has not been huge, so when we started our plastic free challenge we decided to have a good clear out at the same time. I don’t know whether it’s because I’ve moved to a job that’s more mentally demanding or for the fact that now we have our own place that’s 100% our responsibility to keep things tidy but it’s really had an impact on our happiness as we come through the door at the end of the day. Generally I despair at the sight of the kitchen so I walk through to the living room and see washing hung literally everywhere, books and DVDs bulging out of the bookshelf and random bits and bobs filling every other available space. It’s surprisingly stressful and really not a place to relax at the end of a day. Our home office is a mish-mash of all sorts of clutter, too. Tom’s work gear, my camera gear, the ironing board (loaded with more washing) is crammed into a tiny little room, which really is not a productive work place. 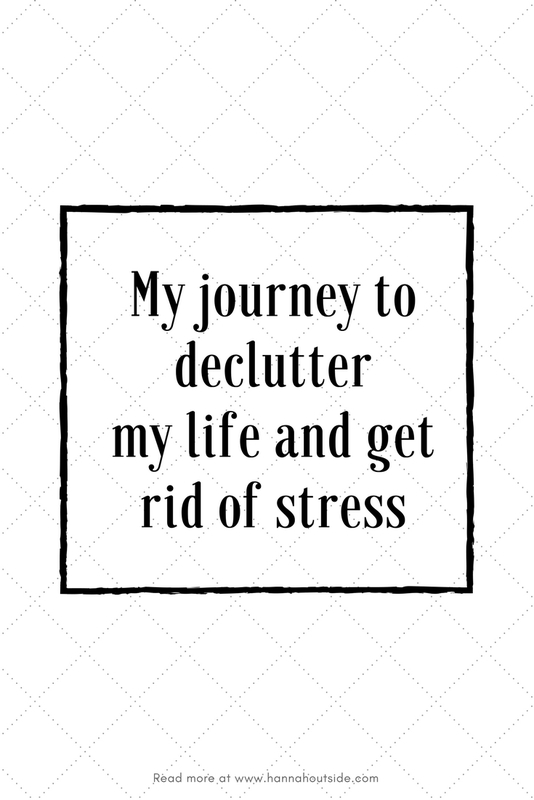 I do wonder whether this is part of the reason I don’t feel overly refreshed when I wake up in the morning – I’ve just been adding needless stress to my life with all this clutter. 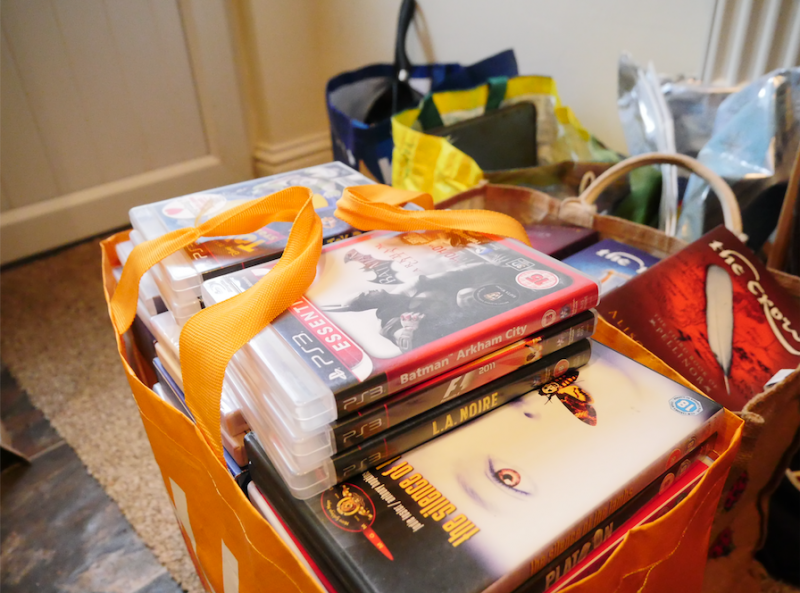 We’ve done odd runs to the charity shop with clothes and various items we haven’t used in a long time but never seriously sat down and gone through our belongings ruthlessly. I know that these things take time but at the same time I’m a terror for keeping things because of sentimental value or because they may be useful some day. The amount of clutter in our house is causing us stress and so it really was time to do something about it. This sudden determination was definitely prompted by Bea Johnson’s book Zero Waste Home. Bea is an advocate of the zero waste movement and she’s made some very brutal cut backs throughout her life. While we’re not sure we’re prepared to live like she does just yet, there were definitely lessons in her book, such as do you really need four wooden cooking spoons?! I do recommend giving it a read – it’s quite refreshing. 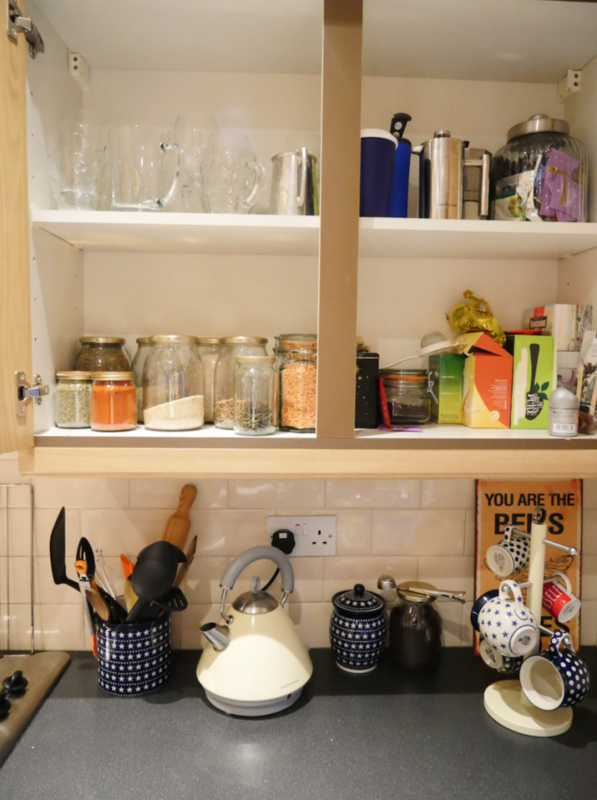 The first room that went through a bit of an overhaul was the kitchen – it seemed an appropriate time as we were changing things up with cutting out plastic (if you’ve not read about this lifestyle change yet click on the picture below). To cut this down we have donated a lot of the crockery and then packed our spare mugs into a box and put in a cupboard that’s really a useless space as it goes back behind the sink. We can pull it out if we need extra mugs. We now have four mugs and two espresso cups on a mug-tree on the countertop and that’s it. By reducing the mugs in the cupboard we now have room for all of the food jars (see below photo) that were lining the counter-top. Pans and pots we don’t use have gone to charity shops too and overall, we now have a much clearer and well-organised kitchen and I’m totally delighted by it. Pans, baking dishes and trays we don’t use have gone to charity shops. Unused crockery has gone to a charity shop. 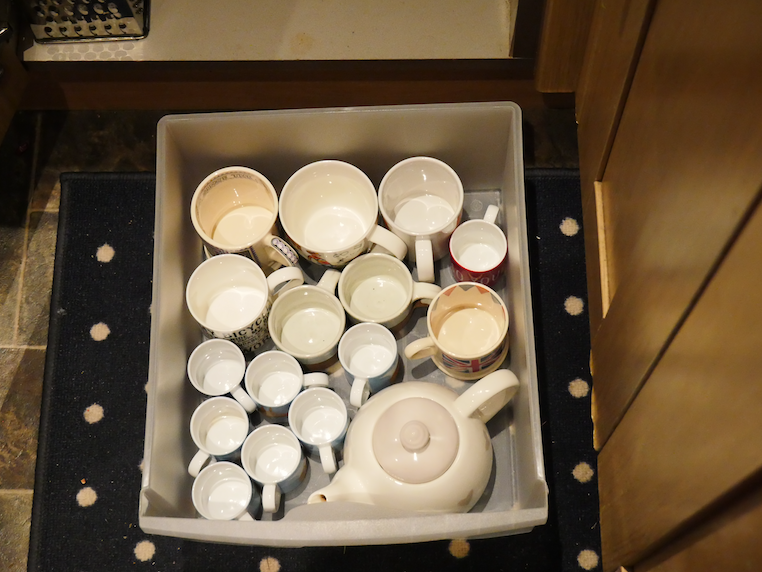 Spare mugs have gone into a box into a lesser used cupboard for when we have visitors and need extras. 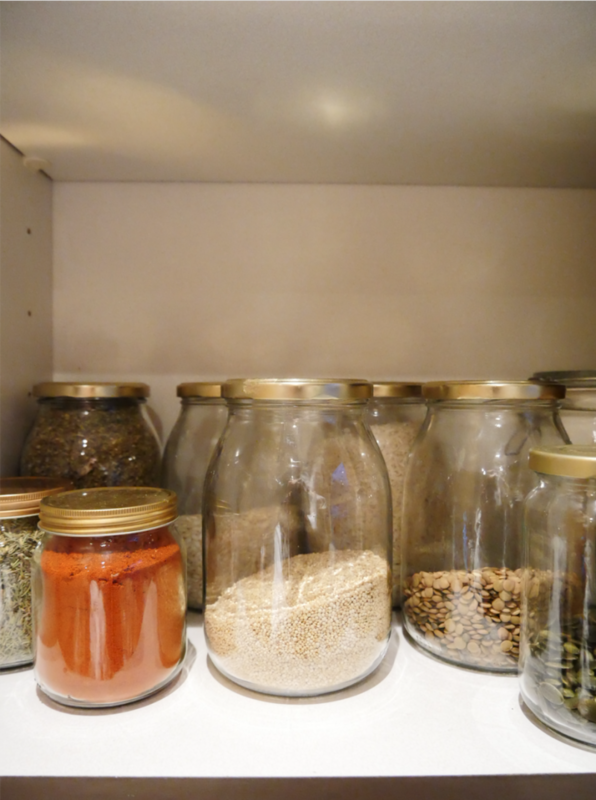 This clears space in our day-to-day cupboard. Allowed us storage for our new glass containers of food so we can see what we’ve got without them cluttering our worktop. 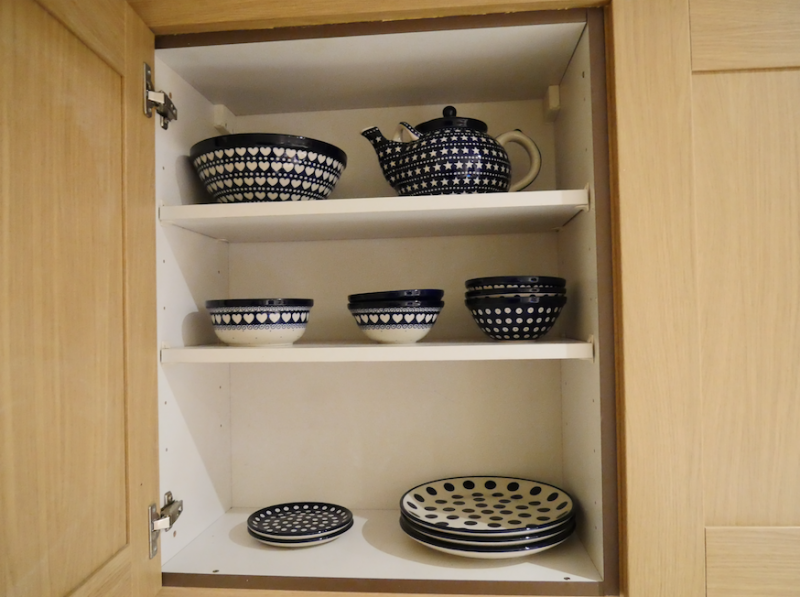 Have fewer items to pack up, transport and clutter our new kitchen when we move house. This is an odd room in our house. 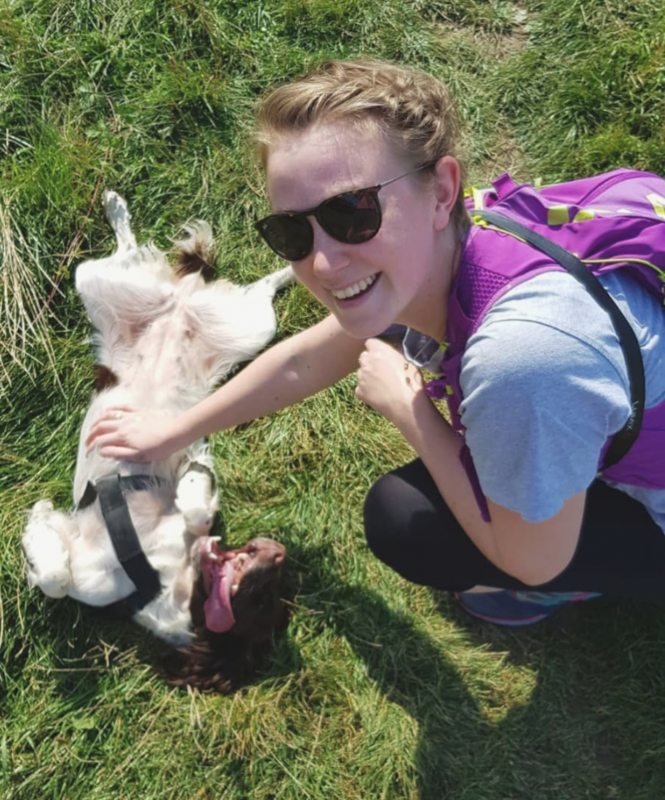 We’ve always known that we wouldn’t stay in this house long, which is one of the reasons I think we’ve stressed ourselves out with clutter – we’ve not found a proper home for a lot of things. As the Christmas decorations came down though we decided to clear this room, too. 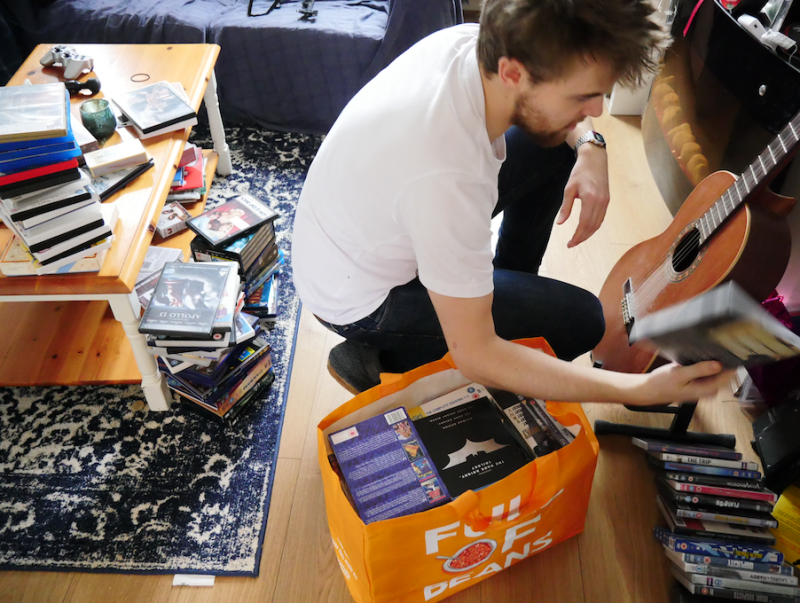 This meant going through all our DVDs and books. 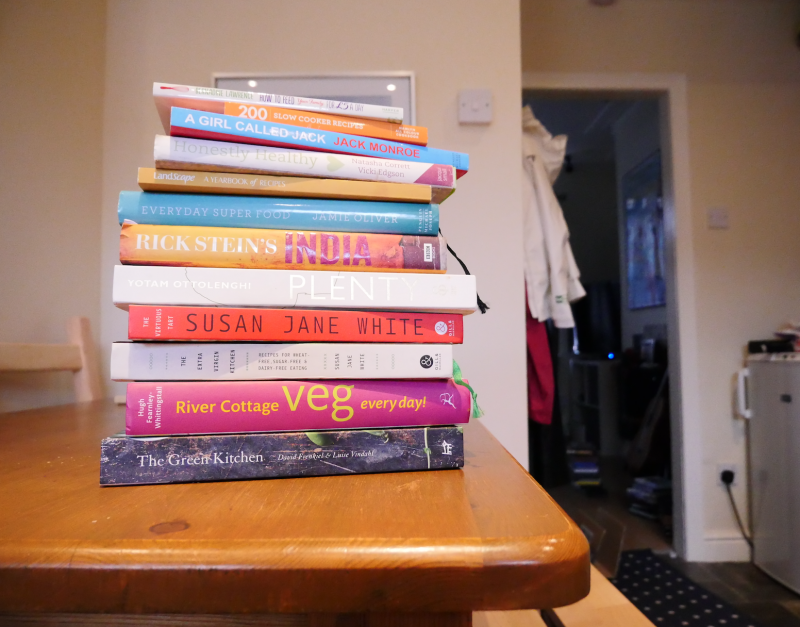 I went through all my cookbooks, which look so lovely on the shelf but in reality I haven’t used them in forever, and scanned in all the recipes I thought I might like to use in future to Google Drive. I’ve kept a few but, as you can see below, a lot have gone and this has created lots of new space on the shelf (YAY). I’m sad to see them go but I feel a big relief at the same time. Have a nice tidy looking bookcase, which is one corner of the room that looks clear and simple. Our bathroom wasn’t too bad. Neither of us have that many cosmetics, moisturisers and shampoos and other random bits and bobs that generally clutter up bathrooms. We only have the odd spare bottle of body wash at any one time. However, I’ve got a bottle of nail varnish remover and some wax strips but I use these so rarely that they can be packed away somewhere out of sight. The other thing is a draw full of hotel miniatures that Tom hoards when he comes back from work trips. He’s promised to stop this now as part of our plastic free lifestyle challenge – and we do actually use them when we go away for the weekend but once they’re gone, they’re gone! All in all, the bottles of random and generally useless stuff are already at a minimal level in our bathroom but all the excess towels were a problem. 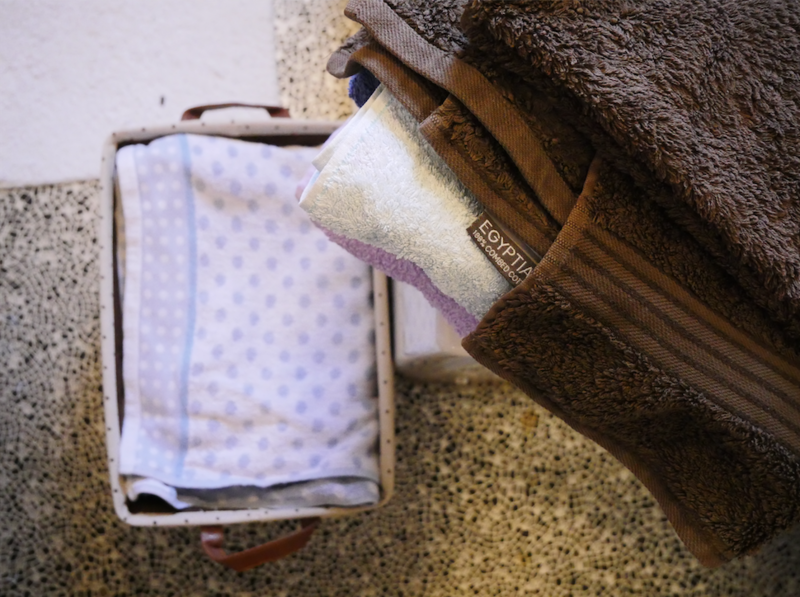 We have three baskets on our shelves: one for body towels, one for hand/travel towels and one for bathroom mats. It got to a bit of a low when I took the washing basket of freshly laundered towels upstairs to put away and I simply couldn’t fit them all in their space. This brought to mind Bea Johnson’s book again where her and her family only have two towels each. Remembering this, I cut a load of our towels – mostly donated by family when we moved to Yorkshire or brought with us from university days. Now we have only five body towels: two for us, two for visitors and one spare. Hand towels were also cut, as were the floor mats. The shelves aren’t bulging so much now and man I love it! Once the plastic bottles are gone – they’re gone. We don’t need ten towels between two people. Less towels means less washing. We only need two sets of floor mats to rotate. 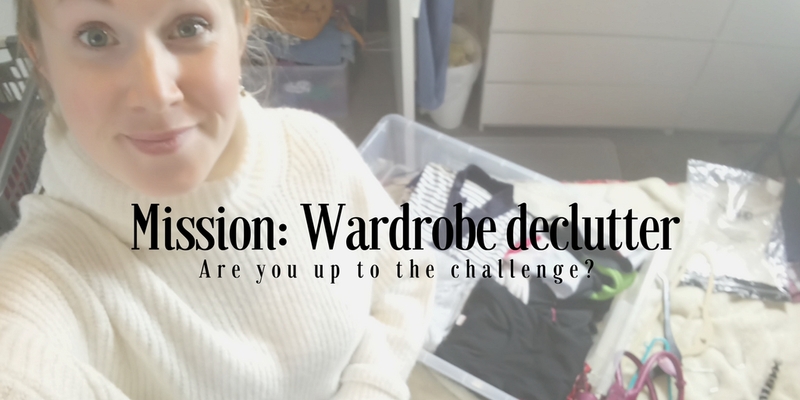 The bedroom and our (*cough* my) wardrobes are a whole challenge in themselves and I think will probably come in a new blog post! Next Post Helvellyn voted Britain’s favourite walk?